At 2:28 pm of October 20, a very specific afternoon time to remember 228 historic event, Justice Action Church of PCT’s Taichung Presbytery held their routine Sunday service at the Watching Tower in Taichung Park to the gate of Taichung Prison, using megaphone to share the sermon, hymn and their support with former President A-Bian now in prison. 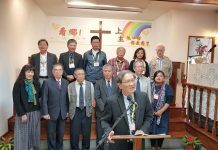 After the service, an assembly called “Democracy Forum” were carried on at the same place, and the speaker spoke out their concern of the human rights and space accommodation of former President A-Bian. Rev. Lin Hse-Jeh, Pastor of Taichung Justice Action Church, quoted Luke 18:9-14 to preach his message as “Good Guys Fall In Hell, Bad Guys Rise to Heaven”. Rev. Lin delivered his sharp critics toward the political rift in September, that some righteously boasted influence peddling is an issue of black and white and it should be condemned without any excuse. But, the poet of Psalm said, “All have turned aside, they have together become corrupt; there is no one who does good, not even one”. Rev. Lin warned the leader should not turn their prayer into performance report, forgetting they have to repent and turn back to hear the voice from God. “Soap is needed to wash our dirty hands, yet when our heart is defiled we need Jesus!”, concluded Rev. Lin. 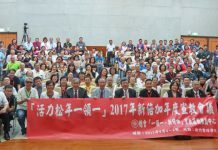 Professor Liu Yao-hua, President of Central Taiwan Society, delivered his thoughts on the relationship between human rights and space. Taking the examples from our daily experiences in household corridor, community park and realty estate, he explained how people got their balance between personal concerns and public interest and then tried to improve their surrounding environments. Pref. Liu urged the fellow students should not only go to Taipei to protest the 4th nuclear power plant but also should come back to concern the air pollution caused by Taichung’s coal fuelled electricity power house. Regarding Taichung’s Justice Action Church, Rev. Lin Hse-Jeh said “This is a church without roof and wall, imitating Jesus from the very beginning of his mission – outdoors and non-stopped by wind or rain”. This is to be reminiscent of our church that there are so many injustice and cruelties in our country, we should use our action to express our care and concern. At present, Justice Action Church holds her routine worship and service on the 1st, 2nd and 4th Sunday every month at the Watching Tower inside Taichung Park, as to the 3rd Sunday the congregation will move to the front gate of Taichung Prison to share their message and fellowship with former President A-Bian. Taichung’s Justice Action Church held service and share their fellowship, at the front gate of Taichung Prison, with former President A-Bian who is inside the prison.